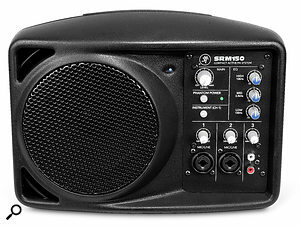 If you're in need of some extremely portable amplification or monitoring, Mackie's tiny SRM150 might just save the day. Mackie describe the SRM150 as a portable active PA system, but it's likely to appeal to most as a personal stage monitor for large gigs. It's no bigger than the average toaster (203 x 284 x 173mm) and weighs just 3.4kg, yet it hosts two Neutrik 'combi' inputs and a stereo RCA phono line input, the last being designed to accommodate personal stereos or electronic keyboards. As well as a built‑in metal carrying handle, the tough but stylish polypropylene enclosure incorporates a chunky aluminium heat sink for the electronics, while a tough metal grille protects the speaker. The front panel is safely recessed out of harm's way, and includes the three-channel mixer. All three channels have their own level controls and there's also a main level knob for adjusting the overall output. There's a switch for full 48V phantom power, and channel one can be toggled to function as a high-impedance instrument input. A three‑band, active master EQ operates at 100Hz, 2.5kHz and 12kHz, with a +/‑15dB range. For personal stage monitoring, the SRM150 can be mounted on a mic stand using the included boom-arm adaptor. There's also a mic-stand thread in the top of the case, so you can fit the included short extension that allows a mic to be positioned just above the speaker, thus avoiding the need to have two mic stands on stage. Alternatively, you can unscrew the boom support from a standard boom stand, and use the included adaptors to fit the boom section above the speaker, which would be preferable from a feedback‑prevention point of view. Although the case isn't really angled steeply enough to hold the speaker at a suitable angle for floor use, you can fit the included stand adaptor into the socket beneath the case to increase the tilt tangle. The SRM150 can also be used as a desktop reference monitor in the studio. 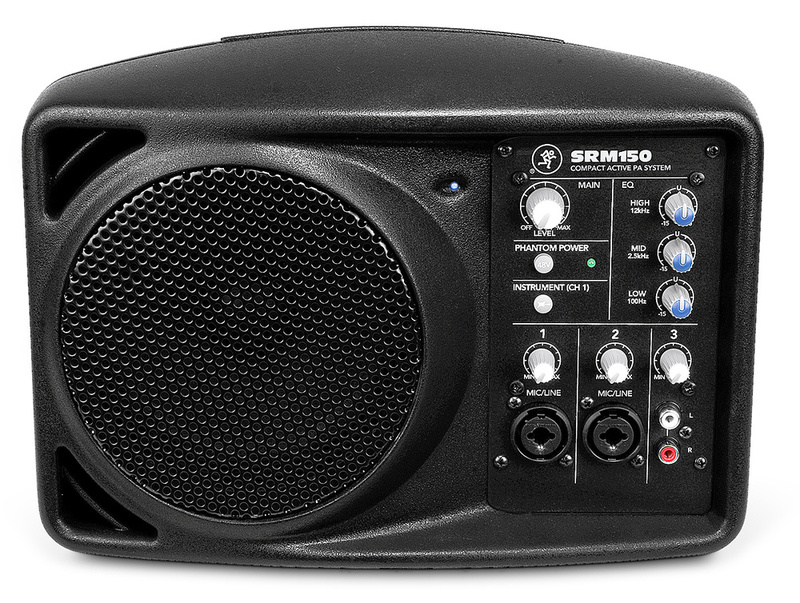 Despite its small size, the SRM150 is driven by a powerful, lightweight 150W Class‑D amplifier. This feeds a 5.25‑inch, full-range, weather‑resistant neodymium driver, which was designed by EAW. This combination is capable of 120dB SPL at one metre, with a quoted frequency range of 100Hz to 17.5kHz, statistics that make the SRM150 useful as a small vocal PA for solo artists and duos playing bars. Meanwhile, a built‑in limiter effectively protects the driver against over‑zealous live use. The rear panel houses the IEC mains inlet, a main input XLR for linking multiple units and a 'Thru' output XLR with a mic- and line‑level switch. In larger venues, where you may want to add a second SRM150 or another powered speaker, the rear-panel Thru XLR makes setup easy. It also allows a mic- or line-level output to be sent on to a larger front-of-house PA system for further routing. The lack of a dedicated tweeter softens the SRM150s high-frequency output slightly, but moving the treble control up a little (to around the one o'clock position) produces a very credible vocal sound with both dynamic and capacitor microphones. Though you can't expect deep bass from a PA speaker of this size, the low‑end reach is adequate to keep vocals from sounding too thin, and as the spec suggests, you can indeed get plenty of volume from the little speaker. In a vocal monitoring situation, you'd reach the feedback threshold long before the amp ran out of power, something I confirmed after taking the SRM150 out to a couple of gigs. For stage monitoring you don't need a lot of low‑end extension, because bass leakage from the main PA fills that in quite adequately. I was impressed by the clarity of sound and the lack of buzzes or rattles, even at higher listening levels. I tried the SRM150 as an extension speaker for an acoustic‑guitar combo, in a very small pub, and it performed really well. I also used it as a cross‑fill monitor for another pub‑duo gig, by placing it on a shelf a couple of metres away, aimed back at us. It worked absolutely brilliantly. The most impressive demonstration of the SRM150's versatile performance came when we set up our main PA for a fairly large beer‑festival gig, only to discover that the power amp (located in one of the subs) had failed. This meant that we'd lost one side of the PA completely, as the amps in the subs also drove the tops. Our only option was to use the SRM150 (our only monitor) as one side of the PA, angled inwards slightly to give us a little foldback. It turned out to be one of the loudest gigs we'd done as a duo and the PA sounded great! Any low end missing from the SRM150 was filled in by the sub on the other side of the stage, so we achieved a well‑balanced sound with plenty of vocal projection. Given the Mackie SRM150's astonishing versatility and ability to save the day, I feel I need to buy one! The Galaxy PA6S monitoring system (£249$299) is a similar option for stage use, though it doesn't have the on-board mixing ability of the Mackie SRM150. There are also similar‑sized powered speakers from companies such as dB, but again they lack the SRM150's versatile mixing facilities. Plenty of different mounting options using included adaptors. Not very much low end. This extremely versatile little speaker can be used as a small vocal PA, a live-sound monitor, a studio talkback speaker, and even a mono studio monitoring reference. It would also make a useful personal monitor for a keyboard player. Although lacking some top‑end airiness, due to having no tweeter, and not having very much in the way of low end, the SRM150 lives up to its design brief exceptionally well. With so many uses, if you play live and run a studio, you have twice as many reasons to buy one. Loud Technologies + 44 (0)1494 557398. Mackie +1 800 258 6883.